Tourism has been Cairo’s largest industry since the 1800’s. It was one of the first towns in the area to develop ski slopes and trails. Many of the regular visitors have made the conversion to seasonal or permanent residents. 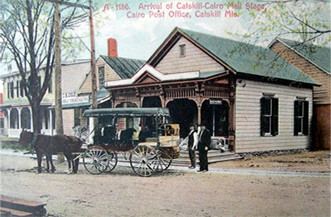 The Cairo Railroad provided freight transportation to the industries in town starting in 1884. Early cargo consisted of locally mined bluestone, and hay and fruit from the local farms. In 1894 the Catskill Shale Brick Company became the railroads primary customer until the plant closed in 1914. The lack of steady freight and the increasing improvements to the local highways resulted in the termination of service at the end of the 1918 tourist season.